Sheffield Eagles have confirmed a double signing after agreeing a deal with ex-Toronto ace Shaun Pick and Swinton front-rower Oliver Davies. Both have agreed two-year deals, with the news following the confirmation that experienced duo Menzie Yere and Simon Brown have agreed new one-year contracts to extend their stay with the club. Pick was part of the Toronto side that won promotion to The Championship last season, (he made eight appearances for them), whilst Davies is formerly of St Helens before moving to Swinton in 2017. Pick, 23, hit the headlines in 2015 when he was hit with a two-year ban after being caught with anabolic steroids in his system during an out-of-competition test. 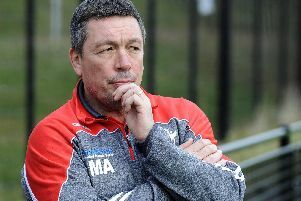 But boss Mark Aston has been impressed with his application since his return to the game, and had no hesitation in bringing him to Sheffield. “He is someone we’ve looked at previously; he will be a valuable addition to us” said Aston. “He served a two-year ban but came back with exactly the right attitude and performed well with Toronto. It was difficult for him to cement a place in their side but that is no detriment to his work ethic and ability. “They had an excellent squad as shown by their automatic promotion and scorelines they dished out.